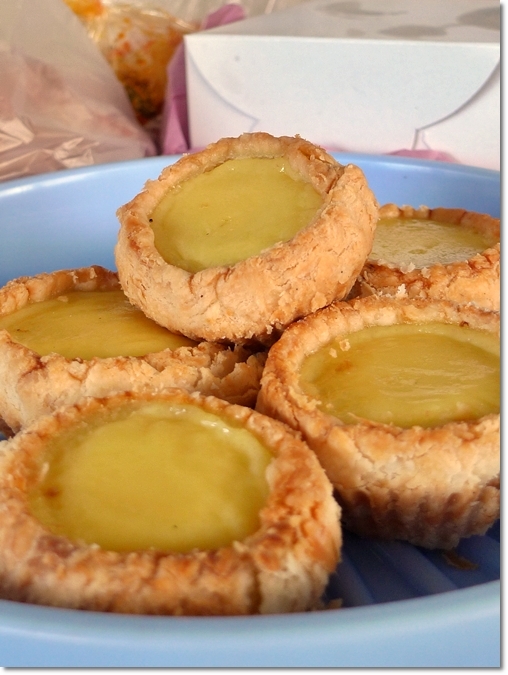 Flaky, crumbly pastry encasing the wobbly, velvety smooth and rich egg custard within – Best Egg Tart in Ipoh? Fridays are supposed to be fun. So here’s a short post on something light, and delectably irresistible. To me at least. Choy Kee Confectioneries has always been my favourite brand of egg tarts in Ipoh. (Read the previous post here). They operate every morning from a humble stall at the Simee wet market in Ipoh. If you’re thinking why-oh-why should you wake up at such inhumane hour to visit a wet market together with the housewives, aunties, uncles and peddlers selling everything from giant bullfrogs to pots and pans, and of course; durians (seasonal, of course). 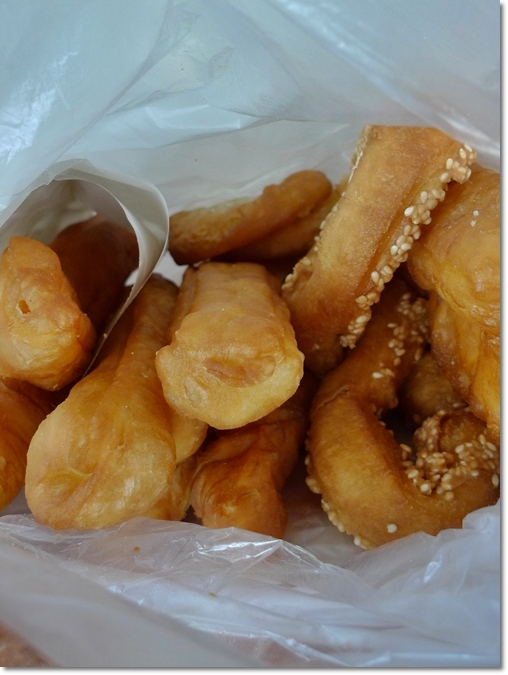 Other than egg tarts, Choy Kee also bakes up a whole medley of sumptuous breads, and pastries. Read on to find out about the other treats you can expect from Simee market, and the location of the market itself …. Choy Kee has a strong history behind the name. In Ipoh, aside from Choy Kee, the other famous egg tart brands are Hong Kee on Jalan Dato Onn Jaafar (Cockman Street) near to the previous Super Kinta, and Nam Heong (the white coffee specialist) bakes reasonably good ones as well. 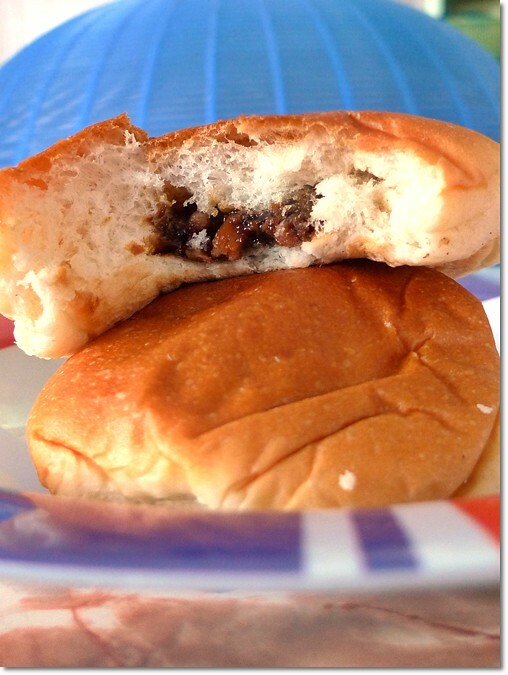 We call this “Charn Pau” – Sticky, caramelized Char Siew fillings enclosed within a baked bun. As traditional as it can get. Choy Kee’s “Gai Sou” (Chicken Pie/Tart), “Char Siew Sou” (BBQ pork fillings in a puff pastry) and “Charn Pau” are all great alternatives, in case the egg tarts run out. Don’t laugh, for the tarts run out VERY fast, especially on weekends and public holidays. They bake them in batches, hence you can ask when will the next batch of freshly-baked tarts will be out from the oven. But the one item I have always been craving for from Choy Kee, and they make them oh-so-randomly is the “Kong Sou Peng” (KSP). A cross between a bun and a cookie, the ultra soft biscuit (if you can even call it that, but ‘peng’ means biscuit in Chinese) with a faintly sweet nuance from the sugary dough has never failed to be termed as ‘comfort food’ in my books. By the way, you can push your luck in seeking for the KSP, for even the lady manning the stall is not sure when they have KSP for sale. The production premise is at another location though, and everything’s transported to this stall at certain intervals via a man on bike. You can catch him with engine roaring and all, zooming his way into the market in the mornings, delivering the confectioneries to this stall. Various dough fritters; but none that stood out like Happy at Canning Garden’s New Hollywood Restaurant. The “Mah Giok” or Horse’s hoof was good, literally covered with sesame seeds. Sweet Potato Balls – Gorgeously golden orange, with a chewy centre and a slightly crispy exterior. At 20 cents per piece, seems like a little upmarket now, ya? 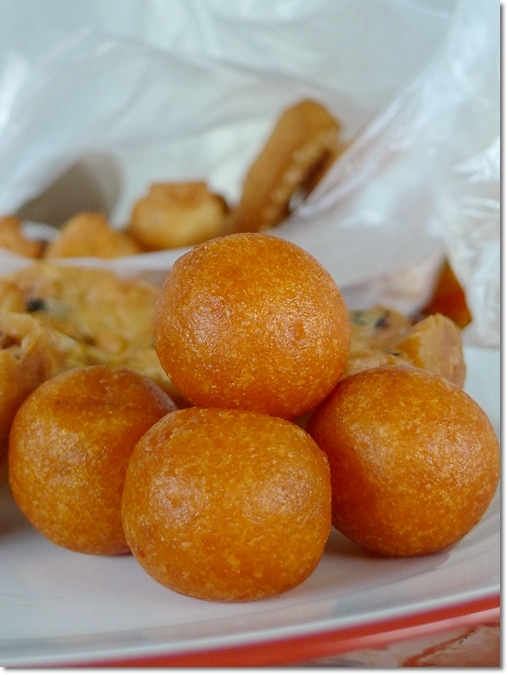 By the way, in case you’re wondering how does the sweet potato ball fare against the famous Petaling Street’s, then I can safely tell you that …. this is way better. I don’t know about you, but I did not like the Petaling Street’s one; in spite of the mass media coverage the lady has been getting from TV channels, blogs, and magazines. The balls tasted slightly artificial, with a starchy texture, and not as pleasantly sweet. Good thing was, she fries them fresh on the spot. So you get piping hot (or maybe scalding?) “Fan Shu Dan” to satisfy your cravings. And if you’re craving for something savoury and more filling …. go for the Cucur Udang (Prawn Crackers) from a stall at the other end of the market. Finishes quite early, hence go for them as early as possible. 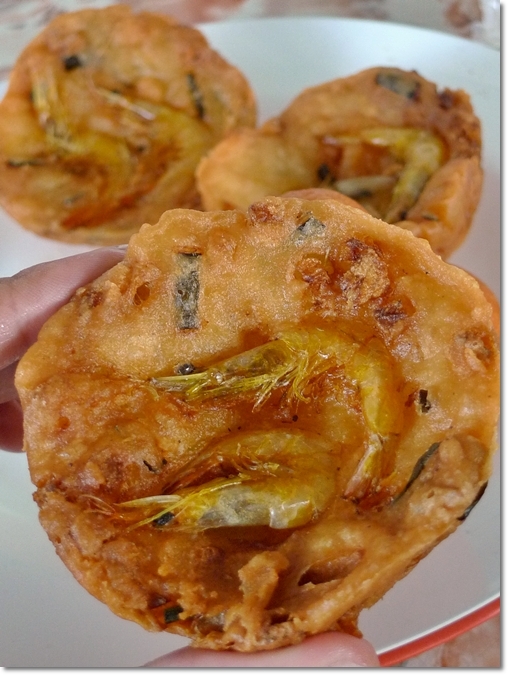 I used to really, really like the Cucur Udang (Chinese version) from a stall at the Ipoh Garden East’s night market every Tuesday. But then the quality dropped drastically, and the “prawns became shrimps”. Then the last I tried, the batter was way too starchy and tasteless, with measly cubes of yambean. But this one from Simee Market is good. Really, really addictive. Maybe slightly greasy, but that’s an understatement. The crunchy crackers, with a soft centre loaded with cubed yambean, and two crispy prawns with shells intact embed in the middle of the snack. Dip the crackers into the chili sauce provided, or without, and I assure you’d be satisfied. Simee Market is located in Kampung Simee near to Ipoh Garden-Tasek-Fair Park in Ipoh. Here’s a GOOGLE MAP to the market situated on Jalan Pasar, Kampung Simee, 31400 Ipoh, Perak. Updated 31st July 2010 – Choy Kee has a branch in Bercham. Here’s their address taken from their site : 37, Persiaran Bercham Timur, Taman Bercham Baru, 31150 Ipoh. Hahah, where’s the CCF review? Everything ta-pau-ed but not by me. I was still sleeping in on a Sunday morning. Anyway, I patronized that CCF stall few times before, and glad to say the CCF sold by the two aunties is very classic, simple without much fuss. I particularly like their mushroom gravy with minced pork. 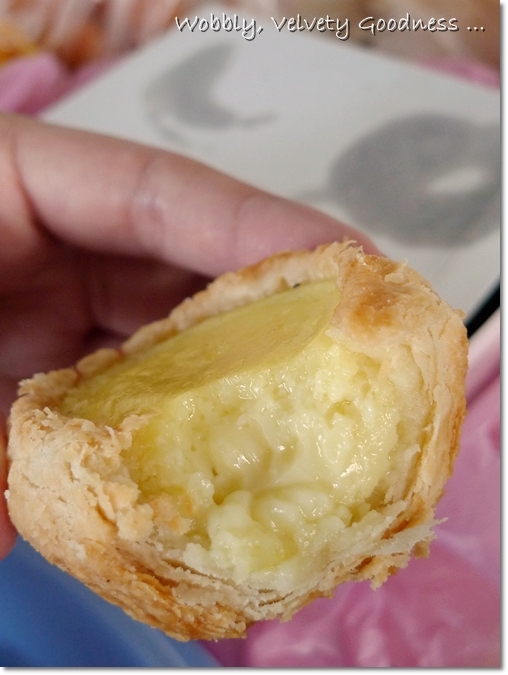 Gosh James… the choy kee egg tarts… must go early morning to simee… i only managed to eat when i go outstation cos that is the only time i wake up early to go to the market.. other than that, always sold out one.. the charn pau is also very nice esp. when it is still freshly warm and soft.. yummy! Yeah, but they have a branch in Bercham! I forgot to mention in the post. I will update that later. You can get the tarts and sit down for some tea I think ……. But the egg tarts there come in batches. I’m so hungry now.. Till now i still haven’t get to taste Choy Kee egg tarts & others.. I’ve always been eating Hong Kee egg tarts.. Perhaps you can help me buy all those yummy snacks & bring to me & i’ll pay you back..
Well i’ll treat you dim sum @RC..*winks*.. hehe..
Melody, I wanna ask you but kept forgetting. Does SFS serve set lunch and/or set dinner now? Egg tarts for a dim sum meal? Haha … so nice ah? At the moment, SFS doesn’t served lunch/dinner set as yet.. shall keep you informed..
Oh I see. Do inform me if SFS decides to serve them. Haha … sure sure. Now let me wait til one fine day when I can wake up that early for the tarts ….. The pastry for the tarts looks thick, but actually tasted good. They’re buttery and flaky. Most importantly, the gorgeous egg custard within. And the chan bao actually has more fillings, but I took one big bite and snapped already. Hehe …. unprofessionally. I work in Kuching for the past 10 years but my home town is Taman Wah Keong, just next to Kg Simee. Like your blog keep it up! Thanks ck. I’m sure you would have tasted this many, many times! Do you know the address for Choy Kee in Menglemnbu ?